A 37‐year‐old woman presented with pain and tingling underneath and behind her left breast for the past two weeks intermittently. She denied trauma or any inciting event. Past medical history and review of systems were noncontributory. Physical exam of the breasts and left chest wall is negative. 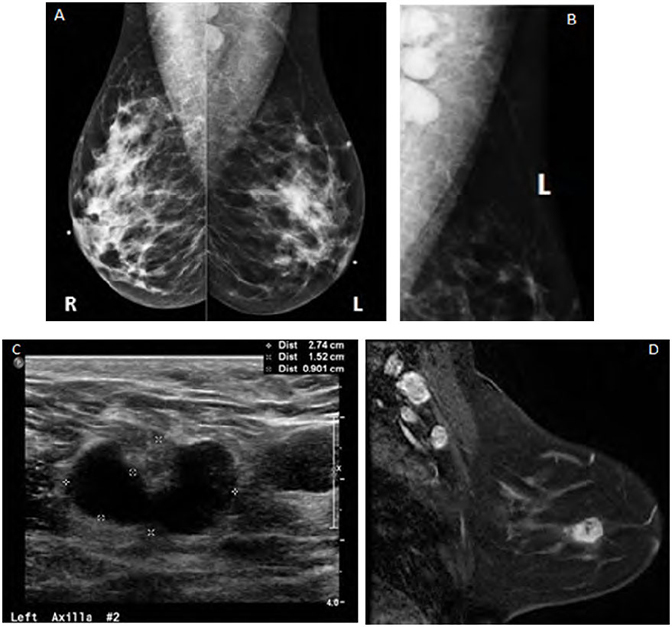 The patient was subsequently referred for diagnostic mammogram, ultrasound, and MRI breast (Figs A‐D). Unilateral axillary adenopathy can present a diagnostic and therapeutic dilemma. Differentiating benign versus malignant causes can be a challenge. Features of axillary lymph nodes that may be considered abnormal include increased size (greater than 2 cm), homogeneously increased density, loss of normal architecture, and occasionally internal calcifications.1 When detected, a thorough history and physical exam may aid in excluding benign causes, such as reactive adenopathy or granulomatous disease. In most cases, further imaging and often biopsy are performed to determine the etiology. A typical workup for unilateral axillary adenopathy detected on mammogram includes bilateral axillary ultrasound and tissue sampling. Additionally, MRI and nuclear medicine imaging may be contributory in the diagnostic and therapeutic approach. Metastases and lymphoma may present with axillary adenopathy, which is more often bilateral but may be unilateral as well. Some of the more common extramammary malignancies that may present with axillary adenopathy include thyroid, lung, gastrointestinal, and pancreatic cancers.3 Ovarian metastases can also present with unilateral axillary adenopathy, but this is quite rare.6 Past medical history and prior imaging may be beneficial in these cases. Axillary adenopathy can be seen in patients with granulomatous diseases, such as tuberculosis or sarcoidosis. Imaging features include enlarged axillary lymph nodes with coarse internal calcifications.6 If granulomatous disease is suspected, prior chest radiographs or chest CTs can confirm pulmonary granulomas and/or calcified mediastinal/hilar lymph nodes. Invasive ductal carcinoma with axillary spread. Unilateral axillary adenopathy detected on imaging should be regarded as suspicious and warrants further investigation. Workup should include, at a minimum, diagnostic mammogram and axillary ultrasound (to confirm unilateral adenopathy); biopsy is often necessary. MRI may be contributory to detect mammographically occult breast masses, as in the case presented here, and is widely being used in the diagnostic approach for malignant axillary adenopathy in the absence of a mammographic abnormality. Nuclear medicine studies (such as PET and BSGI) may also have some benefit in evaluating for underlying breast malignancies.7 Although the diagnostic workup of unilateral axillary adenopathy remains variable, a prudent approach should make every effort to exclude a primary breast malignancy as the cause. The views expressed in this material are those of the author, and do not reflect the official policy or position of the U.S. Government, the Department of Defense, or the Department of the Air Force. Brant W, Helms C. Fundamentals of Diagnostic Radiology, Philadelphia: Lippincott Williams & Wilkins;2007:pgs. Leibman J, Kossoff M. Mammography in women with axillary adenopathy and normal breasts on physical examination: value in detecting occult breast carcinoma. AJR 1992Sep;159:493‐495. Abe H, Naiton H, Umeda T, Shiomi H, Tani T, Kodama M, Okabe H. Occult breast cancer presenting axillary nodal metastasis: a case report. Jpn J Clin Oncol 2000;30(4):185‐ 187. Schelfout K, Kersschot E, Van Goethem M, Thienpont L, Van de Haute J, Roelstraete A, DeSchepper A. Breast MRI in a patient with unilateral axillary adenopathy and unknown primary malignancy. Eur Radiol 2003;13:2128‐2132. D’Orsi CJ, Mendelson EB, Ikeda DM, et al: Breast Imaging Reporting and Data System: ACR BI‐RADS – Breast Imaging Atlas, Reston, VA, American College of Radiology, 2003. Singer C, Blankstein E, Koenigsberg T, Mercado C, Pile‐ Spellman E, Smith, S. Mammographic appearance of axillary lymph node calcification in patients with metastatic ovarian carcinoma. AJR 2001Jun;176:1437‐1440. Cyrlak D, Carpenter P. Breast imaging case of the day. Radiographics 1999;19:S73‐79. Gaffney S. Unilateral Axillary Lymphadenopathy. J Am Osteopath Coll Radiol. 2013;2(1):29. Dr. Gaffney works with the Department of Diagnostic Imaging, Wilford Hall Ambulatory Surgical Center, San Antonio, TX.